When I press CtrlAltB (Go To -> Implementations) currently there's no way to narrow down the list using the package name, one can only start typing the name of the class. If there was a way to do so - I think it would be more comfortable to see right away various extensions of the given class. For example, in JSF when I VtrlAltB UIComponentBase I get a laundry list of various classes from different frameworks - Sun RI, RichFaces, Ajax4Jsf, ours (see the image attached) .. If I could start typing "org.richfaces" to narrow down the list in order to see, say, RichFaces components - this would make the lookup process much faster. supports packages and I don't know how to use it properly? already supports packages and I don't know how to use it properly? >> already supports packages and I don't know how to use it properly? Very nice indeed, thanks for letting us know. Hey, but CtrlAltB still doesn't support that :) Does it work for Ctrl+N only ? Ctrl+N only ? I'm on build 7562. JIRA issue for that is welcome. Just discovered that feature and I actually find the way this has been implemented is quite nice. 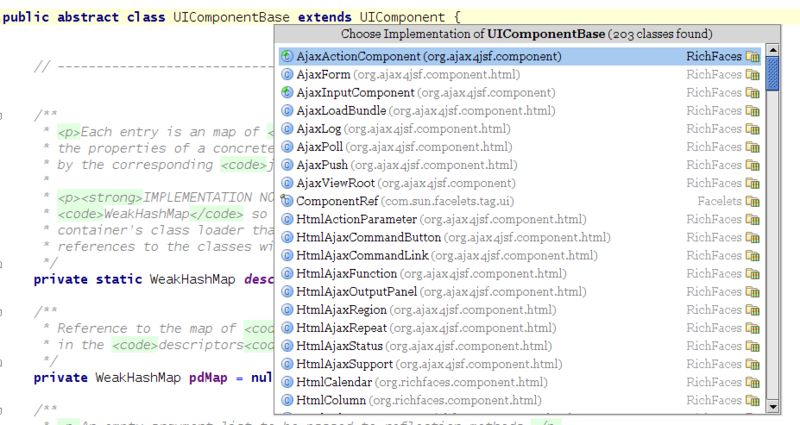 - anything before that is broken down in patterns for packages, but you don't have to include all subpackages. This makes it quite powerful in terms of number of keystrokes needed to refine your search, well done again !